Oh my goodness, are these muffins ever delicious! 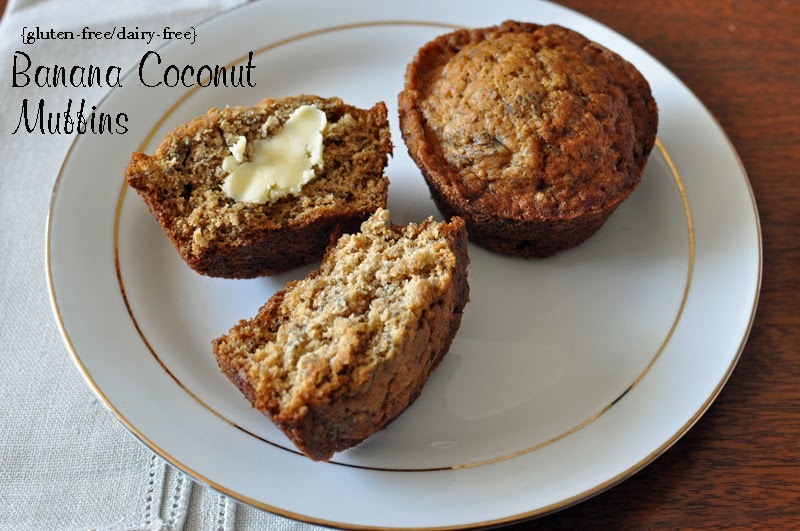 They have the flavor of banana, a slight crunch of chia seeds, and yet none of the gluten, dairy, refined sugar, or vegetable oils that most muffin recipes have. I guess this recipe might be what the pinners are calling these days a clean eating recipe. Well, you have to try them for yourself to believe how tasty they are. There are only 7 ingredients (8 plus a couple tablespoons of water, not pictured here). We ate them for breakfast one morning this week after I woke up at 4 AM, cleaned, ate breakfast, read the paper, and couldn’t get back to sleep and then decided to make muffins. They are great served warm or room temperature as a snack the following day. I’ve been busy, even though this blog has been quiet. The new windows are installed and a breeze to use, make our views more beautiful, and keep the house warmer. We’ve been working on painting trim and general cleaning up after construction. I’ve also been busy hanging up more artwork. It always takes me a while to figure out where I want artworks in a new space. This wall space above the kitchen area is perfect for smaller artworks. Now I am dreaming of colors and ways to give this space a face lift. 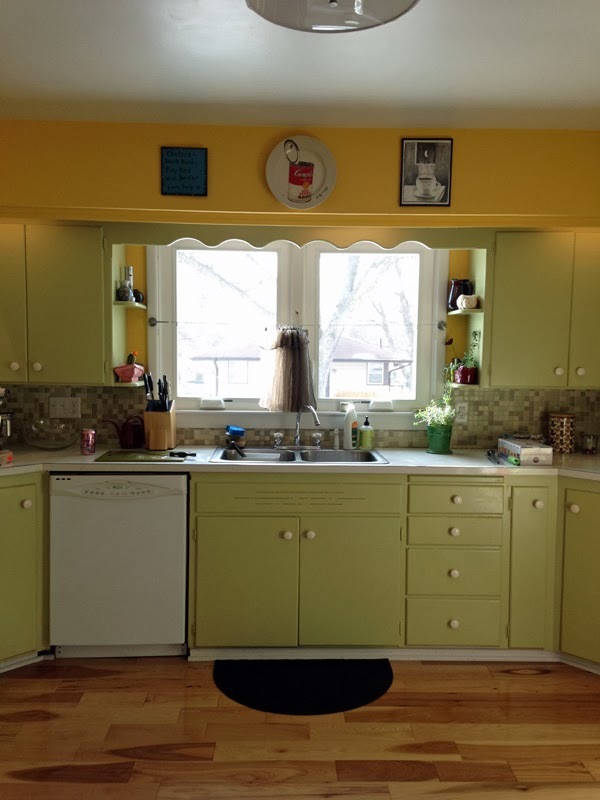 The previous owners painted latex paint over oil paint on the cabinets, which creates the wear without the charm look. Ok, I’m off to do some prep work while Greta naps – I am hosting a triple baby shower brunch tomorrow morning. Look for some more yummy recipes after this weekend. 1. Preheat oven to 350°, prepare standard muffin pan with liners or grease with dairy-free shortening and set aside. In a medium mixing bowl combine: 1-1/2 cups gluten-free all-purpose baking flour, 1/2 cup coconut sugar, and 1-1/2 teaspoons baking soda. 2. 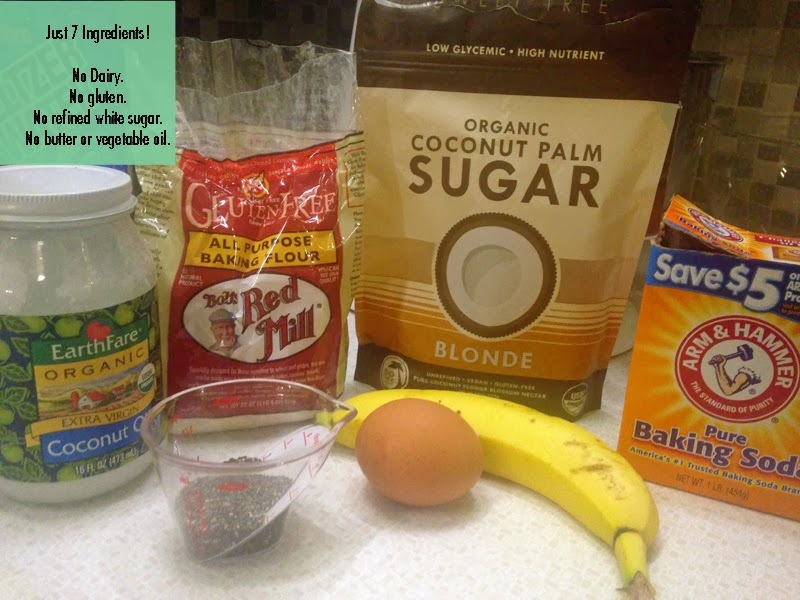 In another medium mixing bowl combine: 1/2 cup melted coconut oil, 2 ripe mashed bananas, 2 tablespoons of chia seeds, 1 beaten egg, and 3 tablespoons water. 3. Make a well in the dry ingredients, add liquid ingredients and combine with a few swift strokes. Pour batter into prepared muffin pan. Place water in any empty muffin cups to prevent warping. 4. Bake in 350° oven for 15-20 minutes or until a toothpick inserted near the center comes out clean. Cool in pan for 5 minutes and then remove muffins to cool on wire rack, or serve warm.